Think these are rules parents have for their kids? Think again. They’re some of the rules for internet and phone use that, given the chance, kids would set for their parents. Researchers at the University of Michigan and the University of Washington surveyed 249 families with children between the ages of 10 and 17. They asked about their household’s most important technology rules and expectations, as well as what made those rules easier or harder to follow. 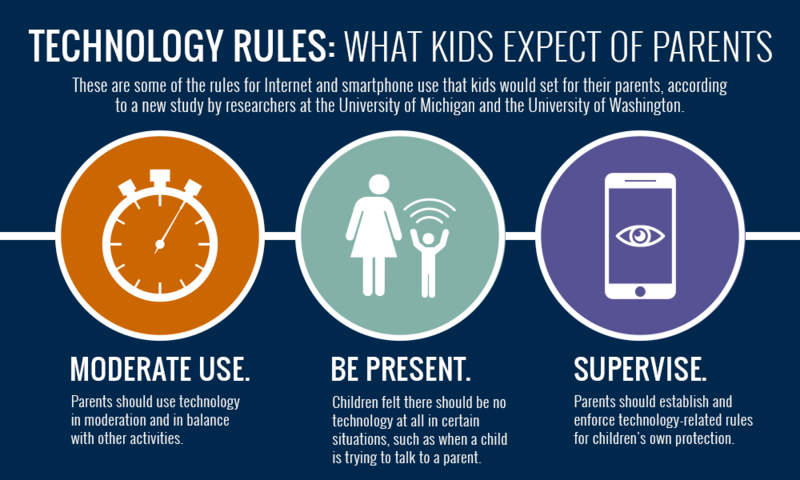 The study is among the first to explore children’s expectations for parents’ technology use. In addition to revealing kids’ feelings about fairness and “oversharing,” it also sheds light on the most effective types of technology rules, and families’ most common approaches. “Managing kids’ technology use was once much easier for parents. They switched off the television when a show was over or kept an eye on kids as they used the family computer in the living room,” says lead author Alexis Hiniker, a doctoral student in human centred design and engineering at the University of Washington. Be present. Children felt there should be no technology at all in certain situations, such as when a child is trying to talk to a parent. Give autonomy. Kids believed parents should let children make their own decisions about technology use, without interference. Moderate use. Parents should use technology in moderation and in balance with other activities. Supervise children. Parents should establish and enforce technology-related rules for children’s own protection. Don’t use while driving. Parents should not text while driving or sitting at a light. No hypocrisy. Parents should practice what they preach, such as staying off the internet at mealtimes. Stop oversharing. Parents shouldn’t share information online about their children without explicit permission. The study also examined which types of household rules were more or less difficult to enforce. Families reported that rules prohibiting certain technology or social media uses entirely were easier to follow and enforce than rules aiming to prevent technology use only in certain situations. So an outright ban on Snapchat or a particular video game was more effective than, say, forbidding phone use during church or texting with friends after a certain time in the evening. Technical fixes to help users find more balance might include a “family time” button that disables notifications for 30 minutes, news feeds that provide opportunities to digest content in smaller chunks, and video streaming that doesn’t automatically start playing a new episode once the last one stops.